00:02 Jamey Hasapis: I’ve always left my future to be open to whatever happens. 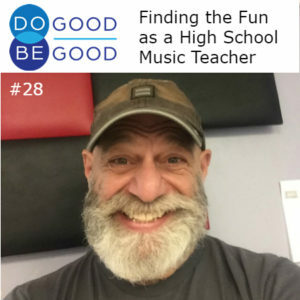 00:07 Speaker 2: This is Do Good, Be Good, the show about helpful people and the challenges they face in trying to do good. Your host is Sharon Tewksbury-Bloom, a career do-gooder who also loves craft beer and a good hard tackle in rugby. Sharon speaks to everyday people about why they do good and what it means to be good. 00:29 Sharon Tewksbury-Bloom: Hello listener. I’m your host, Sharon Tewksbury-Bloom, and the voice you heard at the start of the episode was Jamey Hasapis. Jamey is a friend of mine here in Flagstaff, Arizona, and he’s our guest today. He is also an active volunteer, and he’s involved with all kinds of different nonprofits and community groups throughout the community, and that’s how we got to know each other. We’ve probably volunteered together and met through nonprofits for, I don’t know, over a decade. As a professional vocalist, Jamey is a joy to listen to. I was honored to have him here on the show. He also has got some great stories about his winding career path, in both K12 education as well as corporate education. Let’s get started. 01:21 SB: Did you know you were on a path of a career path? 01:26 JH: No way. I knew what I kind of wanted to do in high school. I wanted to be a music teacher, or a doctor, or a horticulturist. Those were the three things I was really interested in, and I decided to go to the community college ’cause I didn’t get into UCLA like I wanted to. And at the community college, I started taking my GE courses, and then while I was taking those, I was exploring the other three fields. And I thought it was a perfect way to to explore and find out what I really wanted to do as opposed to going to the university and saying, “Oh this is what I’m declaring right now.” And then hating it half way through. And while I did it, I discovered music was where I wanted to be and that education was a big part of it. 02:20 SB: What was it about music that struck you at that early age? 02:24 JH: Music’s been a part of my life since I was a little kid. My first memory is from being a toddler, and it’s still vivid in my mind. My grandparents had this little, small, maybe 600 square foot house, and what I remember was my grandfather’s cousin sitting by the window by the door and these three dining room chairs. One had a bouzouki, which is kind of like a large mandolin; another had a clarinet, and another had an oud drum. And they were playing, and I was just fascinated by that. And then my family, of course, were Greek and when you got music going you’ve gotta dance. And so, we’re doing traditional dancing, holding onto each other’s hand and doing this circle dancing all the way through the house; from the dining room… Well, living room, dining room into the kitchen and just going around and just having that big party thing. 03:27 JH: And that’s how I remember my first experience of music, but my family’s always sung together, especially my mom’s side of the family. She had five sisters, and they always sang. And when we had family get-togethers, we’d sing and then we’d always have pizza and beer on the weekends it seemed like. In those days there was an organist in every pizza pub or a piano player, honky-tonk piano. And they would project the words to the songs on the wall, and the whole place is singing. It was just incredible fun times. And when we were kids, my parents taught us how to harmonize. So instead of driving around in a car listening to the radio, which we could have, it was good old AM back then. My dad turned the radio off and we’d sing songs and harmonize, four part harmony. So, when I transferred to the university, I auditioned for both the trombone instrumental department and for the voice department, and I was accepted in both with lessons provided, scholarship for lessons. And I could only choose one, so I chose voice. So I majored in voice vocal performance and music education. 04:42 SB: Awesome, and where did that education piece come in for you? There seems like there’s definitely the track to just performance, but seems like, even from an early age, you wanted to add that education side. 04:53 JH: I love performing. My first performing job was when I was 12. I was in a marching band; I got paid $15 to march in the band, yay. I’d like to just perform. It’s just one of those things, but I also like to educate. I spent 20 plus years working in doing what you’re doing today, and I always had that back in my mind that I wanted to teach. Before moving here I got certified in elementary, and then I just let that ride because my first job here was with the symphony after I resigned from the other position. And I’ve just been working in nonprofit after that and then singing and performing. I have always performed. I have not stopped performing at all. 05:41 JH: In 30 years… I graduated… It took me a while to get my degree ’cause I worked full-time. And then plus with the performance and education degree, there’s a lot of other things that you have to do. So I had to cut down on my academic in order to do everything I needed to do. And in 1981 I was doing student teaching and I hated it. I had a really bad experience, but I still love teaching. 06:06 SB: What happened? Tell me what was bad about it. 06:08 JH: I had a teacher that was disillusioned as my mentor, and it ended up that I was doing all the teaching and not ready for it. I was just thrown in there and not really coached through it, or anything else, and it was not a good experience. So I, at the last minute, switched my major to liberal arts music and finished off and got the degree in music liberal arts, but most of my emphasis was in performance. Actually all my emphasis at that time was performance and education until that last semester. 06:56 JH: It was when we had to do the concert, and he didn’t show up. 07:00 JH: That scared the heck out of me and ruined it for me at that moment. I think if I would have had a different experience, I definitely would have been doing that from the time I graduated, but I thought, “I’ll take another path.” It was in Southern California, and so I went downtown and started doing showcases and singing and trying to make it. You know, well it wasn’t happening, and I was hungry, so I went into banking. My friends are doing well in banking, and it seems like a pretty cool job. 8:00 to 5:00, nothing before and after. Oh, that’s even better than teaching. Then while I was there, I discovered training and development. I thought, “Oh, I have my degree in education, I’m going to take that path.” I’ve always left my future to be open to whatever happens and use whatever I’m doing at this moment or that moment to learn all I can and develop whatever skills I develop. And then I take those skills that I’ve developed and transfer them into the next, into the next. And so I started doing training inside the branch, what I understood there and using my education degree and the theories and everything to train people. 08:17 JH: Straight into banking. 08:21 JH: Well, to me it was just like going back into retail, and I grew up in it. So, it was taking those skill sets that I had when I was a kid and transferring over. And then what I learned in college, I went, “Oh, I can apply this here and applied it as a training specialist and in curriculum development. 08:40 SB: Yeah, now that I’m in the training space, there are a lot of people that have some sort of background in theater or in performance. 08:49 JH: It’s a great background to have. While I was in training and development, I studied things like improvisation. 08:57 SB: Yeah, I just actually was referencing a physical improv class that I took, and I took a physical improv class because that’s one of the pieces of feedback I got in my speaking was that I wasn’t using my body well enough and I wasn’t gesturing enough or appropriately enough or big enough and… Yeah, I just don’t feel comfortable doing that. 09:19 JH: You gotta be natural. 09:55 JH: Everybody’s going like, “Ohhh… ” Yeah. 10:00 JH: Absolutely. It’s the same thing with singing, with my choirs. I really work with these young kids on how we can be in tune with our breathing. I had my sixth graders on the floor two days ago doing planks. And the planks really… Some of them are going, ” Oh yeah, this is like PE” “Okay cool.” But really trying to get them to be in tune with their breathing ’cause while you’re in a plank position, there’s only one way to breathe and that’s correctly. I also use PE, these things that kind of excite these kids, “And this is how this is gonna help you do this. How many of you swim? How many hold your breath, and where do you breathe when you do that?” “Oh yeah.” “When you’re playing soccer, where are you breathing? Are you breathing up high? No.” So I’m really trying to see those relationships that are happening and getting them to realize that I need to breathe the same way as when I’m running. 11:00 SB: I hope you’re enjoying Jamie’s story. To support our show please consider buying a Do Good, Be Good shirt or sweatshirt. They are on sale now and you can find the details at our website, dogoodbegoodshow.com or on the Facebook page, facebook.com/dogoodbegoodshow. The other thing that would really help us is if you could rate and review the show in whatever podcast player you listen to us in; that would be superb. This is a way that people can help find the show. So whether it’s Apple podcast, Stitcher, Google music, whichever podcast player you use, if you could go in there and just click five stars or whatever you think is fair, that would be fantastic. Thank you so much; let’s get back to our conversation. 11:53 JH: You just reminded me, my first PR job, that I ever had … I was managing the admin services for Southern California for the bank I was in, I took a respite from training and development saying, “Well, if I’m gonna train and teach people how to do these jobs, or how to be a manager and things, I want to go into that role, into one of those roles.” So, I took about three years and ran all of admin services for this major bank, and part of it was mail services, courier services, all the copiers; everything that had to do with administration, that’s what I was doing. Another learning experience, taking old skills and bringing them into that other environment. People were hoarding interoffice envelopes. Okay, so I did a campaign on the extinct interoffice envelopes. I’d say, “Please help; help them survive from extinction.” So it was a whole, non-extinction campaign that I did for these envelopes; sent out memos, and a campaign poster, and all this to all the branches and internal departments and everything. I was getting them with these notes. Yes, I wanna save the interoffice envelope; let’s save them, like save the giraffes or the zebras. Let’s save the interoffice envelope. 13:15 JH: We did that. I was getting hundreds of them in per day just because it had this really kind of fun type of campaign, and I was getting them three years later after I started the campaign, was still getting those same things with the interoffice envelopes being returned to the mail services department. I think the key thing is you find the fun in every job that you do. When it ceases to be fun, then you need to take an inventory of yourself and say, “Am I in the right place now?” And if you’re not, it’s time to find something and take that internal look at yourself and say, “Okay what am I ready for now? Not what I want to do, what am I ready for?” Because even though I wanted to teach back in 1982 I really wasn’t ready, and now I was brought in last year of saying, “Oh, I need you to substitute at my school.” “Oh sure, I’ll try it.” It’s being open to try different things. I was confident about it. 15:51 JH: You always have to be ready for what’s facing you, like with any situation. You have to have the skills to be able to react to what’s in front of you and what is being presented to you, and then you have to think quickly. I think that’s why I love teaching because it is so fluid. Yeah, I have my idea of what I want to do but what the students come up with is crazy. Today, I tried a new example with my jazz choir. I was introducing them to a technique called circle singing, and I was just gonna try one part and then just forget it. Well, I had them… Instead of me giving them melodies to sing in rhythms, after I presented that to them and did an example with them, I said, “Okay, it’s your turn. Bases, come up with a line. Altos, first sopranos, second sopranos, and all of a sudden we had this incredible ensemble performing something that was absolutely original and new. 16:57 JH: Then I said, “Anybody want to improvise? Here’s an opportunity now to start improvising.” Nobody did, so I did. And then they’re looking at me like, “Oh wow, you really know your stuff.” Then I went on to, I said, “So who’s next?” And so one of my sopranos said, “I wanna try it.” “Go for it, ready, go.” And she started doing it, and then I said, “Now when you’re done point to another musician in the circle. And I don’t call them singers, I call them musicians because singers always get the bad rap of being singers instead of musicians, so we’re really developing ourselves as that musician and not singers. 17:36 SB: The vocal instrument. 17:52 SB: Yeah. Did you find anything when you’ve got into this current role that was positive and unexpected? 18:02 JH: The outcomes that I’m getting. That is so positive and so unexpected. And there’s some really negative things that are happening to that are unexpected, where I was expecting certain things from certain students that’s not happening; so we’re having discussions, and setting standards and expectations, and where they need to be and things like that. It’s just the same way I’d be doing as coaching an employee. [chuckle] It’s the same thing. So there, education, coaching an employee, it’s the same thing. And then I have to report it to somebody and guess who’s next in line to be reported to? It’s the parents during parent night, so there’s no difference, no difference at all. But, yeah, like I told you with the sixth graders, with my jazz choir, with my middle schoolers, they are so far ahead of where I was imagining them. But I think a lot of it is motivating them. 18:58 JH: What is motivating these kids to perform? Key thing is having fun, but, also having progress; so having that progress and achieving something, but having a good time while you’re doing it. I have a couple of students in one of my classes who have not been known to participate in anything. They’re participating, smiling, singing, laughing. They’re doing all these things that they have not been doing in other classrooms. Why? Because we’re making it fun. With our warm-ups, I’ll do crazy, silly things just to get them energized. Yeah, we did some warm-ups today where they would just start giggling and laughing, and it was great. One of my colleagues, we have a competition going on. There’s a thing that we do our sirens to help open up the voice, and your whole throat, and all your resonances and get that all going, connecting your head voice to your chest voice and all. And so we do them and then one day we hear from the classroom next door, echoing our sirens. So now my colleague and I are… We have a competition every day during those classes, and my class loves it. 20:11 JH: My middle schoolers today, we heard the classroom and it was so loud, it was so good, that they turned around and applauded them. That’s the kind of things that you try to get to make that enjoyable and want people to come back to your classroom, even if you’re teaching history, even if you’re teaching math or English, making it just where they participate as of being disengaged and just sitting there. In the past, I’ve done science festivals. Now, this year, I’m doing a speech or my presentation on the science of singing. So what science is involved in the process of singing? And I got that from one of my students last semester. I was teaching a breathing lesson and he said, “I didn’t realize this was gonna be science class.” And I said, “Oh, you just brought up a great point. Let me show you some other things about breathing.” And I started showing anatomically what happens, and how it breaths, and the physics of it, their like, “Really?” Their eyes were like, “There is science to this.” But there is. It’s all there. 21:16 SB: Awesome, so my last question, which I always ask is, the show is called, “Do good, Be good. So what does it mean to you to be good? 21:26 JH: To be good? Oh, gosh. To be good is to be a good example, to be an example of what it is to be giving, to be helpful, to be there, to listen, be open to people you don’t even know. You see somebody that is in a little trouble or hurting or something, you go up to them and say, “How can I help you?” You don’t say, “What’s wrong?” You just say, “How can I help you? You look like you’re in trouble or you need some help.” I don’t know. People seem to come up to me and they just see me and come up and tell me all their what’s going on in their lives automatically. So I have a sense of openness about me that I don’t know, I don’t realize until people come up and say that or just open up. And so, there I am as an ear. I’m listening, not butting in when somebody is trying to tell me something, but just sit there and listen and help them come up with solutions. Not me providing solutions, but help them come up with solutions to resolve whatever issue is there. 22:40 SB: I am so glad I could introduce you to my friend Jamie. Thank you, Jamie, for coming on the show. Next week, our guest is another friend of mine, Chris Hannemann. I have actually known Chris since fifth grade. Chris is a mechanical engineer, and he also has Type 1 diabetes. Chris was one of the first five people to try out an Artificial Pancreas System. Don’t worry, he explains what that is, the risks he faced and why he did it, on our next episode. You definitely won’t wanna miss it, so why not subscribe? Just pull up Apple Podcast, Stitcher, Google Music, whatever podcast app you like and search Do Good, Be Good. Subscribe and you will never miss an episode again. And thanks, again, to our host Sun Sounds of Arizona. And, of course a shout out to my editor, Bob Larkin. Thanks, Bob. Music in this episode is Bathed in Fine Dust by Andy G. Cohen released under Creative Commons Attribution International license and discovered in the free music archive. Until next week, this is Sharon Tewksbury-Bloom, signing off.